Immortality is a powerful seductress. From the moment we’re old enough to appreciate our status as slowly decaying sacks of flesh, cells and gray matter, society encourages us to fight against aging with an arsenal of drug-store beauty products, modern medicine and more. We all age, but nobody ages better than superagers, an elite class of geriatrics whose cognitive functions are considered equivalent to those of people half their age. 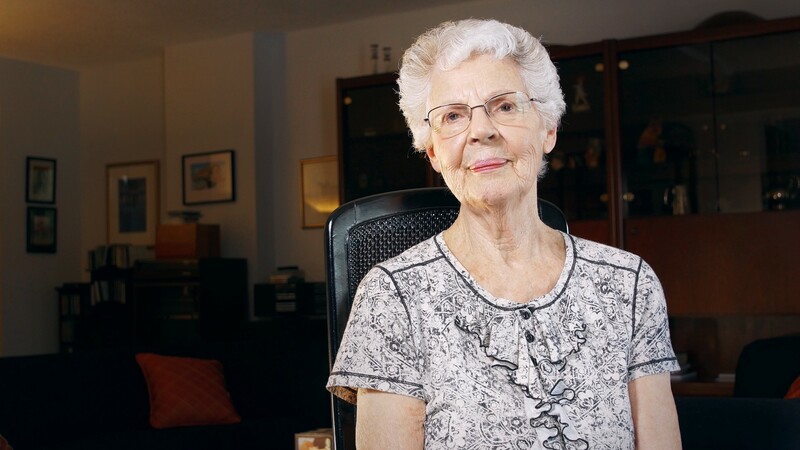 88-year-old Evelyn Finegan is one such superager and on a Friday in June, I drove to her home in River Forest, IL to learn exactly what that means. Alzheimer’s is the sixth leading cause of death in the United States and one third of people over 85 will develop dementia. With no cure available, it’s unsurprising that the prospect of aging is met with trepidation. Still, growing older gets a bad rap. The media is quick to report on the negative aspects of maturing, rarely focusing on the positives. Emily Rogalski and her team at the Cognitive Neurology and Alzheimer’s Disease Center (CNADC) are looking to change all that by uncovering new ways to tackle Alzheimer’s. Over the last 20 years, the CNADC — one of 31 active Alzheimer’s disease centers in the country — has recruited 2,000 volunteers to participate in longitudinal research studies on cognition, aging and Alzheimer’s. Traditionally, dementia research examines the brain to pinpoint problems and enact solutions. CNADC researchers, however, study what is “going right with the brain” in the hopes of synthesizing that information and providing useful recommendations for future generations. There is no universally agreed upon definition for aging successfully. Some studies define successful agers as people who live to 65 without developing dementia; others ascribe success in aging solely to longevity. In 2006, scientists reviewed 28 successful aging studies and found 29 separate definitions for the term. This lack of cohesive terminology posed a challenge for scientists, so in 2007, neurologist Marsel Mesulam created a new term: superagers. Superagers are people over age 80 whose memory performance is in line with that of a person in their 50s or 60s. Many successful aging studies require that participants possess good mental and physical health, but for superagers, a strong memory is all that’s necessary. Emily says that for the CNADC study, the mobility spectrum is wide: some participants show up in wheelchairs, while others are leading their group exercise classes. Superager Evelyn Finegan falls somewhere in between these two camps. During our initial phone call, she mentions that her hearing is going and while emailing to arrange our date, I note the large font she employs, a nod to her poor vision. As I drive up to her apartment building, I worry that my presence might prove burdensome or exhausting for her; it doesn’t take me long to realize how wrong I am. I pull into the wrong driveway and see her waiting for me outside. She scolds me for not heeding her parking instructions before escorting me upstairs. From the moment we meet until the moment we say goodbye, Evelyn is energetic, welcoming and completely disarming. When I first asked Emily to put me in contact with a superager, she warned me that they are “very busy.” She was not exaggerating. A typical day for Evelyn begins at 6:00 AM, when she collects the Chicago Tribune from outside the beautifully decorated apartment where she’s lived for the last 31 years. After reading the paper with a magnifying glass, she might head out to to the library, grocery store or to her volunteer job at a local thrift store. Advances in medical science mean that humans are living longer than ever, but — as Emily points out — there’s a noticeable imbalance between life span and health span. The goal of the superager study is to improve quality of life so that people are able to live both long and well. There is no way to definitively say how many people like Evelyn exist in the world. Since Northwestern did its study, over 1,000 senior citizens have called in to see if they qualify; less than 5% turned out to be superagers. The million-dollar question about superagers, Emily tells me, is how to become one. Science has yet to determine whether superagers are born or made, and the study’s participants have such diverse backgrounds and lifestyles that it’s likely there may be more than one track to maintaining strong cognitive function in old age. Evelyn was not surprised to learn she was a superager, but she is unsure which of her behaviors contributed to her success in aging. A reformed smoker, she enjoys wine with dinner and treats herself to the occasional margarita. She eats well and says that cleaning makes up the lion’s share of her exercise routine. Evelyn first learned of the superager study eight years ago while perusing the bulletin board at her friend Grayce Papp’s apartment building. Evelyn and Grayce became friends in high school and both are considered superagers. Grayce, who was already 80, was able to join the study immediately, but Evelyn, who was only 79 at the time, had to wait a few months to qualify. She recalls that during a telephone screening designed to test her memory, a researcher asked her to “name all the animals you know.” Evelyn, who recently returned from a safari in Africa, was unfazed. As we age, our brain’s cortex or outer region loses thickness, but superager brains do not degenerate at the same rate as regular agers. After comparing superager brains to the brains of both octogenarians and 50-year-olds, CNADC researchers determined that not only do superager brains maintain thickness better than the brains of their peers, but a brain region called the anterior cingulate cortex looks stronger in superagers than it does in 50-year-olds. For Evelyn, the path to becoming a superager began in 1929, when she was born a Depression-era baby. She spent her life defying social conventions, forgoing marriage in her 20s in favor of traveling abroad. She speaks frankly about her experiences as a working woman in the 50s and a single mom and sole breadwinner in the 60s. Perhaps the biggest indicator of Evelyn’s superager status is her resiliency. Chronic stress can erode critical brain regions, but when asked how she handles adversity, Evelyn explains that she’s rarely stressed. She proves this by remaining unruffled throughout our morning together, even after our video team commandeered her living room to accommodate all our filming equipment. Where other people might use their age as an excuse to opt out of engaging with popular culture, Evelyn dives in. She has strong opinions on Facebook (she hates the platform, but likes their stock options), Downton Abbey (she owns all the DVDs) and cellphones (she wants an iPhone, but plans to stick with her “dinosaur phone” until her eyesight improves). Before her knee gave out, she was an avid walker and she only recently stopped biking. Listening to her discuss her social life makes me both jealous and tired.